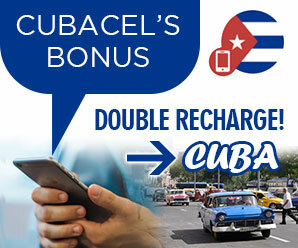 cubacienfuegos.com | Want to know before you go? Official Cuba Cienfuegos information and guide, get facts and latest news. Many visitors to Cuba are overwhelmed at just how unauthentic places like Varadero have become. Almost completely devoid of that “Cubaness” you went to Cuba in the first place to experience. 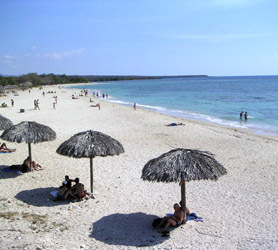 Rancho Luna Beach in Cienfuegos is however different, since it seems to encapsulate this whole “cubaism” we all search in Cuba, in one small stretch of sand. It’s very local, not too touristic and this shows because young Cuban mothers are bathing their children here and, old Cubans are reading novels while you swim. The beach also has lifeguards, which is pretty rare at national beaches in Cuba. The rocky coast beyond the beach is ideal for snorkeling and you’ll be able to get gear from the lifeguards in exchange for a few dollars. The incredible Cienfuegos reef is just 200 meters from beach and is literally teeming with tropical fish and coral. Yes, Rancho Luna the nicest and most authentic beach you are likely to find either in Cienfuegos or pretty much anywhere else in Cuba. One of the early evening highlights are the local fishermen parading back and forth on the beach with their fresh catches of fish, lobster and squid. Rancho Luna Beach is idyllic, you’ll see. If you only visit one war museum in Cuba, just five blocks northwest of the Parque Martí is the ornate pink building containing the Naval museum of Cienfuegos. Dating back to 1933 the Museo Historico Naval Nacional in Cienfuegos is probably the most interesting but overlooked of museums in Cuba. 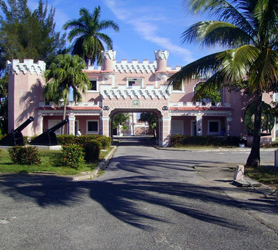 It’s based in the former headquarters of the southern naval command center; it is approached by a wide driveway, flanked with armaments dating from different eras. From the outside it does not look particularly interesting or appealing, however it offers some the best displays on the history of the Cuban Navy in the whole of Cuba. In fact, it was this very place in September 1957 that a group of sailors and civilians staged an unsuccessful uprising against the Batista regime. This revolt is the central theme of the museum. The museum explores in depth this anti-Batista rebellion of 5 September 1957, and the country’s declaration of war on Germany, Tokyo, and Rome. 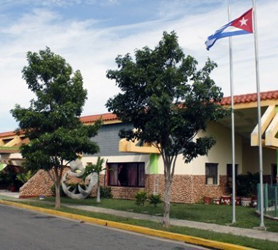 The Museo Historio Naval Nacional also provides some interesting information on the Bay of Pigs Invasion at Playa Giron as well as other assorted items like old Spanish coins and other maritime finds. As an added caveat, if you would like some great photos of the city, the ramparts of the museum offer great views of Cienfuegos Bay. 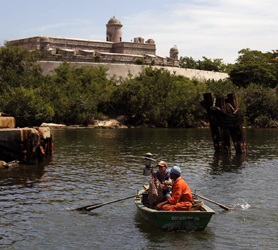 Plagued by bandits, buccaneers and pirates, Spanish king Philip V decided to build a fortress in Cienfuegos to protect the entrance to the city’s bay in the 1740s. It was originally called the Castillo de Nuestra Señora de los Ángeles de Jagua due to the name of the location known as Jagua, just outside the city. The Jagua Fortress or in Spanish Castillo de Jagua. It was declared a National Monument on October 10, 1978 and opened as a museum on March 24, 1998. La Fortaleza has architectural tones from the European Middle Ages, including the moat that surrounds it, but its adaptation to the terrain make it very similar to other American fortifications in the Caribbean. However, it remains as a genuine expression of Renaissance architecture. Typical tactical attributes are the square front steps leading to a drawbridge supported by pillars and flanking the main entrance, designed to prevent communication with the interior of the fortress. The Cathedral of Our Lady of the Immaculate Conception is located on the main city square called Parque Marti and was completed in 1819. A building of immense beauty it is the pride Cienfuegos residents. 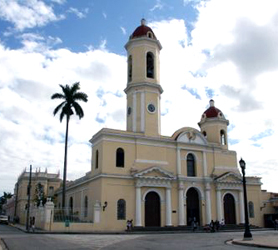 The Cienfuegos Cathedral has a neo-Classical façade with two large red bell towers of differing heights, three arched entrances and French stained glass windows of the Twelve Apostles. It also boasts beautiful French ornate carvings. The first ever house of worship of Cienfuegos has been declared a National Monument. The Cathedral de la Purisima Concepcion is the most prominent building on the main square and impossible to miss. 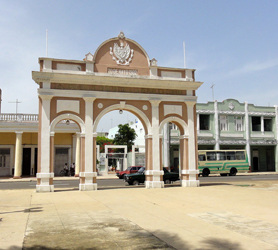 The Historic Centre of Cienfuegos is located in the city of Cienfuegos and cover the small area of the downtown area of the city. Its historical importance was recognized by UNESCO in 2005 when it was declared a World Heritage Site. The epic Cathedral of Cienfuegos and miniature Arch of Triumph give visitors some idea just how much money was flowing through Cienfuegos in the 18 and 19th centuries, either due to the sugar trade, slave trade or both. The Botanical Garden of Cienfuegos covering 97 hectares is also a significant accomplishment for the city and it too was declared National Monument on October 20, 1989. The Reina Cemetery is an exceptional illustration of its type, and its architecture is perfectly featured within the widespread neoclassical buildings constructed in the city. Is the only Cemetery in Cuba that retains its permanence for local burials. Another amazing structure is the Fortress of Nuestra Señora de los Ángeles de Jagua which is located at the entrance of the city’s Bay called “Jagua”. Intentionally located at the entrance to the Port of Cienfuegos to protect the city from pirates, this castle was built in the 18th century around 1745 to defend Cienfuegos from the military assaults, pirates and buccaneers. Another smaller but also interesting sight is the Tomás Acea Cemetery. For those wandering around the city, the park dedicated to “José Martí” will certainly be either your starting point or the base of your general exploration. Finally, we cannot leave Cienfuegos without mentioning the still active Theatre Tomas Terry or the equally important University of Cienfuegos. Cienfuegos Cuba is by far one of the least recognized epicenters of architecture and history in Cuba and should be included on any visit to the island, even if you spend one day, you will not be disappointed. 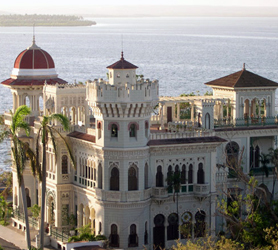 The Valle Palace is located in the Punta Gorda area of Cienfuegos, just a few minutes outside the downtown area. Easily one of the true architectural jewels of Cienfuegos it displays a myriad of influences from Gothic to Romanesque, Baroque to Italianate tendencies, and all mish massed into one building. From all angles the building is truly breathtaking. Today the Palacio de Valle Cienfuegos is used for cultural events. It also features a rather good seafood restaurant with a bar. It is also home to the National Heritage Memorial in Cienfuegos. Construction of Palacio de Valle began in 1913 and the work was entrusted to Italian architect Alfredo Colli. It was completed just 4 years later in 1917 and took the accolade as one of Cuba’s most expensive buildings projects of the century. Wood carver Antonio Barcenas from Spain made the gateway to the while the painter Miguel Lamoglia painted the beautiful crystals of Carrara marble staircase. The Valle Palace or Palacio de Valle Cienfuegos in Spanish, is one of the true architectural marvels of the city and should not be missed at any cost. 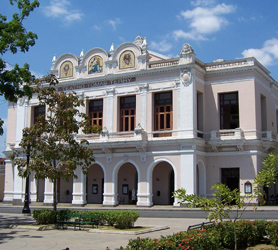 Probably one of the most historic buildings in Cienfuegos has to be the Teatro Tomas Terry. Built in 1889 it was, at the time, one of the largest capacity theaters in the Caribbean designed for 1200 people. Unlike many historic theatres around the world, the Terry Theater of Cienfuegos is still used regularly for performances. Admission fee to simply view the theater itself is 10 pesos (or $50 cents). This impressive building in Cienfuegos is located on the north side of Parque Marti. The theatre was built in homage to Tomas Terry by his family, as a tribute to the man and after his death. An impressive statue of Tomas Terry watches over the theater from the lobby. With clearly Italian architecture, the theatre was conceived by the architect Lino Sanchez Marmol. For many the promise of petting and swimming with dolphins is a once in a life experience. 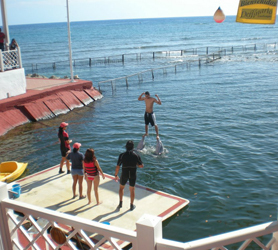 The Dolphinarium of Cienfuegos offers excellent shows, dolphin acrobatics and the inimitable Dolphin contact with visitors. At just 15 CUC entrance fee, this show should not be missed. Located 5 minutes from downtown Cienfuegos the Dolphinarium of Cienfuegos is one of the few in Cuba which allows guests varied levels of contact with Dolphins. For those with the courage, two dolphins are trained to lift you from the water! Of course, kids and adults can pet dolphins on the poolside if the aforementioned is a little too adventurous. There´s also an entertaining segment where kids are towed around the aquarium in a tiny yellow row boat in which they can take turns with up to two kids at a time. Visitors to Cienfuegos consider this one the city’s most important attractions, in fact walking through the caves of El Nicho Mountains, experiencing the amazing wildlife, flora and fauna of the area is true serenity in itself. All the way through the reserve you’ll find picturesque waterfalls inviting you to bathe in the crystalline clear waters of the natural pools at the base of each cascade. These are probably some of the most attractive natural rock swimming pools in the western hemisphere. For those interested in bird-watching, this is one of Cuba’s protected sanctuaries, offering amazing array of colors and species in plain eyesight. Cuba’s national bird, the Tocororo, lives in this mountain region making the valleys around Cienfuegos its natural habitat. To get there from Cienfuegos is simple, either by renting a car or choosing one of varied excursions tours to the area. From Cienfuegos the group tours use Minibuses that will pick you up at any location in the city or at your hotel between 8 and 9am and return you to the same place. 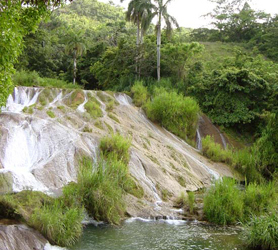 The average cost of a one day excursion to cost for one day trip to El Nicho Waterfalls Cienfuegos is around $30.